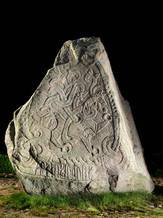 The large Jelling Stone was raised by Harald Bluetooth in memory of his parents Gorm and Thyra. At the same time Harald clearly characterizes himself as Christian ruler. The inscription reads "King Harald ordered these kumbls made in memory of Gorm, his father, and in memory of Thyra, his mother; that Harald who won for himself all of Denmark and Norway and made the Danes Christian". The large rune stone is of light grey granitic gneiss with a natural red-veined patterning. It naturally has three sides, which have been made use of for a text side and two picture sides. The runic script is familiar, but the motifs that are represented are new to Scandinavia. The inscription is in horizontal lines and the two picture sides are reminiscent of pages in a manuscript. The human figure, which for a long time was interpreted as a portrait of the king himself, is the oldest depiction from Denmark of Christ on the cross, or perhaps more likely, Christ in the Tree of Life. 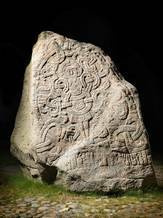 Harald’s rune stone can be traced back in written sources to 1586, when Caspar Markdanner, the vassal at Koldinghus, gave orders to “dig up the stone in the churchyard that stands here outside the church door”. Markdanner presumably made sure that the soil, which had accumulated around the rune stone, was removed. A restoration of the stone in 1981 confirmed that it stands in its original position, at the midpoint between the two mounds. 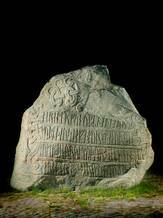 Harald Bluetooth’s rune stone, the large Jelling Stone, which is also called "Denmark's certificate of baptism".